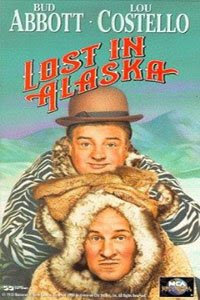 Today July 28th "Lost in Alaska" opened in 1952. The time is the 1890s, and the place is San Francisco. 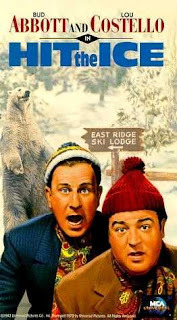 George Ball (Lou Costello) and Tom Watson (Bud Abbott) are firemen who rescue 'Nugget' Joe McDermott (Tom Ewell) from committing suicide by drowning. Joe wants to die because his girlfriend, Rosette (Mitzi Green) no longer loves him. He tells George and Tom about his fortune in gold that he has stashed in Alaska, and they decide to keep an eye on him. Joe receives a letter from Rosette claiming that she still loves him. He returns to Alaska, with George and Tom in tow. Once they arrive, it is learned that many people want to kill Joe, as he was once the local sheriff who had many people hanged. Rosette works at a casino whose owner, Jake Stillman (Bruce Cabot), demands that she marry Joe, whom Jake plans to kill once he is married to Rosette, so that he can marry her and gain the fortune in gold. 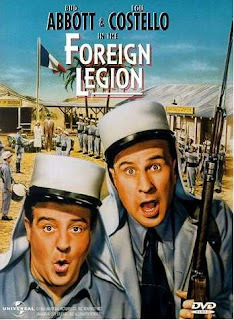 Today July 18th "Abbott and Costello in the Foreign Legion" opened in 1950. Bud Jones (Bud Abbott) and Lou Hotchkiss (Lou Costello) are wrestling promoters. Their star, Abdullah (Wee Willie Davis), no longer wishes to follow the script for their crooked matches, especially since he is supposed to lose his next match. Abdullah leaves America to return to his homeland, Algeria. The promoters' financiers, a syndicate that has lent them $5,000 to bring Abdullah to the States, are now requiring them to return the money or face the consequences. The two men follow Abdullah to Algeria in hopes of bringing him back. Meanwhile, Abdullah's cousin, Sheik Hamud El Khalid (Douglass Dumbrille) and a crooked Foreign Legionnaire, Sergeant Axmann (Water Slezak), have been raiding a railroad construction site in order to extort "protection" money from the railroad company. When Bud and Lou arrive, they are mistaken for company spies, and the Sheik and Axmann attempt to murder them. As each attempt fails, the assassins' hatred for Bud and Lou intensifies, especially when Lou outbids the Sheik for six slave girls, one of whom, Nicole (Patricia Medina), is actually a French spy assigned to gain entry into the Sheik's camp. The boys are then chased, only to wind up hiding at the Foreign Legion headquarters, where Axmann convinces them to join. 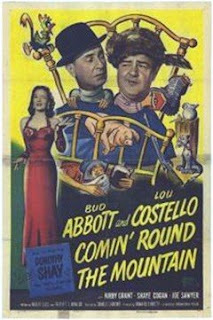 Today July 18th "Comin' Round the Mountain" opened in 1951. Theatrical agent Al Stewart (Bud Abbott) has successfully booked his client, Dorothy McCoy (Dorothy Shay), "The Manhattan Hillbilly", at a New York nightclub. Unfortunately, he has also booked an inept escape artist, The Great Wilbert (Lou Costello), at the same location. During his performance, Wilbert cannot escape from his shackles and screams for help. Dorothy recognizes Wilbert's shrill scream as the 'McCoy clan yell'. More evidence of Wilbert's heritage, namely a photograph and concertina, are found in his dressing room, and prove that he is the long-lost grandson of 'Squeeze Box' McCoy, leader of the McCoy clan. Granny McCoy (Ida Moore) has been looking for Wilbert, as she will reveal where Squeeze Box hid his gold to 'kin folk' only. Al, Dorothy and Wilbert head to Kentucky, and Granny recounts the story of the McCoy-Winfield feud that began over sixty years ago. The McCoys choose Wilbert to represent them against Devil Dan Winfield (Glenn Strange) in a turkey shoot. Wilbert has never even seen a gun before, and his carelessness leads to a revival of the feud. Granny informs Wilbert that even though he is Squeeze Box's kin, he must get married before the location of the gold can be revealed. Wilbert proposes to Dorothy, who declines because she is in love with Clark Winfield (Kirby Grant). Wilbert then goes to Aunt Huddy (Margaret Hamilton) to obtain a love potion to use on Dorothy. While obtaining the potion, Huddy and Wilbert make voodoo dolls of each other and proceed to stick pins in them, which inflicts pain in the other person. After finally obtaining the potion, Wilbert gets on Huddy's broom (complete with windshield and wipers), flies through the door, and crashes into a tree. 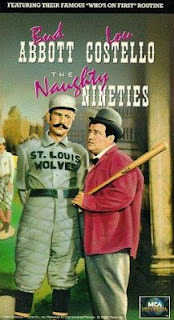 Today July 6th "The Naughty Nineties" opened in 1945. The time is the 1890s, and Captain Sam (Henry Travers), owner of the showboat River Queen, is travelling from port to port along the Mississippi River, bringing his entertainment to each town. During one stop, in the river town of Ironville, he meets up with three individuals, Crawford (Alan Curtis), Bonita (Rita Johnson), and Bailey (Joe Sawyer), who are hiding from the local sheriff. Against the advice of his daughter Caroline (Lois Collier), his lead actor Dexter Broadhurst (Bud Abbott), and his chief roustabout Sebastian Dinwiddle (Lou Costello), the Captain joins them for a card game at a local gambling house. In Scott Allen Nollen's new book Abbott and Costello on the Home Front: A Critical Study of the Wartime Films, his goal was to examine "the production, content, and reception of 18 films within the context of wartime events on the home front and abroad." Although, he does succeed in his goal of discussing the film's production, content and reception; he fails to relate them to the events of the time. He brings a love and new insight to the material that makes the book an enjoyable read. More importantly, he adds new anecdotes and stories that have been revealed, in recent years, which adds, immensely, to the overall depth and understanding of these two great Comedians but at no point does the book tie together nor fulfills the promise of putting these stories into the context of this traumatic time in American history. In 1975, Jim Mulholland wrote the quintessential book on Abbott and Costello, The Abbott and Costello Book; since then, no one has been able to recapture the life and career of this great comedic team. Scott Allen Nollen, in this book, comes as close as anyone since Jim Mulholland. The book is well written and in a style that is easily understood; it is illustrated with some amazing photos and lobby cards, from the author's personal collection, which adds to the overall enjoyment of the book and because of this it is a must read for any Abbott and Costello fan. However, it fails to deliver a critical study but rather is a retelling of the Mulholland’s book in terms of these 18 films. Although it is well written and has new insight, it could have been greatly improved had he only given us what he had promised.